"I cannot but feel surprised that a theory -which thus teaches us humility for the past, faith in the present, and hope for the future, should have been regarded as opposed to the principles of Christianity, or the interests of true religion." LUBBOCK'S "Prehistoric Times," 2nd edition, p. 581. THE Theory of the Evolution of Living Beings, more familiarly known as the Theory of the Origin of Species, has continued to attract an increasing amount of public attention, ever since 1 859, when Darwin published his great work on the subject. Although the principle of Evolution was not new, yet the crude and unscientific speculations of the earlier Evolutionists had failed to produce any deep or permanent impression on either the scientific or the popular mind ; and it was left for Darwin and Wallace to promulgate a theory which could be seen to be both scientifically probable, and easily intelligible, and capable of accounting for a great number of familiar facts which had previously been regarded as lying almost beyond the domain of science, and therefore as incapable of explanation. It is universally acknowledged that no one can read one of Darwin's elaborate works on this subject, without admiring the great amount of learning and industry displayed in the marvellous array of facts collected from every conceivable source, which are brought forward to illustrate even the most trifling point under discussion. The literature of the subject has now become very extensive, and Darwin's views are accepted, with more or less reservation, by nearly all scientific men, as a key to the mysteries of Nature. Among the supporters of Evolution may be found men of every shade of opinion, from Herbert Spencer, who asserts that Atheism, Pantheism and Theism are all equally untenable, to St. George Mivart, who attempts to show that the teachings of the Fathers of the Church are in accordance with Evolution. But although the main principle of Evolution is now conceded by most naturalists, there is a great difference of opinion on matters of detail, and the subject is evidently still in its infancy. It must not be supposed that Darwin's views, comprehensive and valuable as they are, are by any means final ; and every general work on Evolution attempts to develop the subject more extensively, or to throw light on certain questions which still remain obscure. It is often as important to point out the fallacies in the conclusions of others, as to state a new truth ; for in science, as in arithmetic, a mistake in one figure will often affect the whole sum. There is little doubt that Evolution is still far from presenting the aspect which it will ultimately assume in the science of the future. The religious aspects of Evolution, though frequently discussed, are still far from having received a satisfactory solution. One reason may be that pure science resembles pure mathematics in only being able to deal with subjects which fall directly within its grasp. 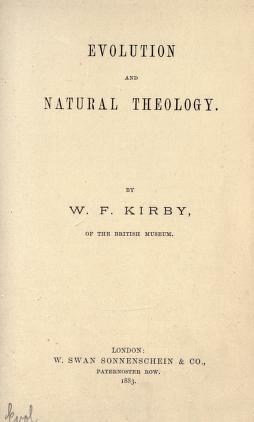 Pure science will not conduct us far if the theological aspect of a theory has to be considered ; for religious questions depend upon the constitution of the human mind, and we cannot call in science to enable us to analyse our own minds by their own powers from any really independent or scientifically unexceptionable standpoint. Nevertheless, a man is not justified in rejecting Religion, because (even after eliminating absurd or contradictory dogmas, with nothing to support them but authority) it presents him with insoluble enigmas if argued out by strict logic. .
A physiologist might as well refuse food as long as any problem connected with the process of x Introduction. digestion remained unsolved; or a philosopher might as well refuse to eat, because he admits himself to be incapable of proving either his own existence or that of his dinner, it is perhaps unnecessary to add that the above remarks are intended to apply to Religion in the abstract, quite independently of any system of dogmatic theology. As, however, the bias of an author must affect his whole work, it may be stated that the existence and perfection of the Deity are here assumed from the outset, without any discussion of evidences, which would lead us too far from our main object. The chief points which we have endeavoured to establish are : (1) the worthlessness of the opinions of antiquity on matters of natural science ; (2) the great superiority from a scientific point of view, as well as in physical and moral evidence, of the Theory of Evolution over that of Special Creation; and (3) that Evolution is perfectly consistent with an enlightened Theism. Some of the supporters of Evolution claim for it that it is wholly opposed to the belief in a God, and many of its opponents brand it as thoroughly Atheistic in its tendencies. We shall attempt to show that this is not the case : but that as the Theory of Special Creation has become scientifically untenable, it is this theory, and not that of Evolution, which is positively Atheistic in its tendencies. The principles of Evolution may be traced throughout every branch of Science without exception ; but we are here principally concerned with that branch of the subject known as the Origin of Species, and our illustrations are taken chiefly from Zoology. The conclusions of previous authors (including those of Darwin himself) are freely criticised ; and it is possible that new light may be found to be thrown on certain phases of the subject. There is no real conflict between Religion and Science ; it is only the worn-out theological beliefs of past ages which conflict with the latter, when the increased light of the present age demonstrates them to be false, or even immoral. Religion and Science both lead us on to the discovery of higher and higher truths ; and the progress of truth is the advancement of the human race on the path which God has indicated by science and history as that by which it is His intention ultimately to lead all living beings, whether regarded as species or individuals, to Himself. ANCIENT AND MODERN VIEWS OF NATURE. EVOLUTION IN ASTRONOMY AND PHILOLOGY. Infinite Change throughout the Universe Evolution an Established Principle in all Sciences Astronomy Philology Analogy between Philological and Biological Evolution 30 xiv Contents. EARLIER THEORIES CONNECTED WITH EVOLUTION. USE AND DISUSE, REVERSION AND HYBRIDISM. ORIGIN OF LIFE ON THE EARTH. COURSE OF DEVELOPMENT ON THE EARTH. Succession of Forms Theory of Direct Creation Subversive of the Argument from Design Immutability and Universality of the Laws of Nature Wallace's View of the Origin of Man Absolute and Relative Perfection Progress of Vertebrate Animals Man Geologically Analogous to a Class Extinction of Species Small Species usually Survive Larger Apparent Exceptions Social Hymenoptera Intelligence of Vertebrate Animals The Dog Indestructibility of Life Preexistence and Successive Existences . 137 xvi Contents. THE DESTRUCTIVE AGENCIES OF NATURE. But, as far as I know, the only significant Western Marxist or anarchist who has really expressed interest in the radical content of Islamic thought is the rather marginal Peter Lamborn Wilson (aka Hakim Bey), although a handful of bloggers, such as Eugene Plawiuk and the convert Yakoub Islam, have done so.